Fritillaries are relatives of lilies that are planted as bulbs like tulips and daffodils. They come in a wide range of growth habits and flower colors and make a stunning display when massed with other spring-blooming bulbs in flower beds. There are dozens of species of fritillary, ranging from six inches tall to over four feet in height, often with exotic colors and patterns on the petals. Their one commonality is the drooping bell-shaped flowers that appear in spring along with a few strap-like leaves. The crown imperial fritillary is the most widely grown and has a cluster of large yellow, orange or red flowers atop a three-foot stalk. The flower stalk is crowned with a cluster of small leaves, like a shaggy hairdo. Lutea Maxima is a classic yellow-flowered variety. Rubra Maxima has orange-red flowers. The Persian fritillary grows to two feet or more with numerous flowers atop a stalk with blue-tinted wavy-textured leaves. Ivory Bells has four-foot stalks with off-white blossoms. Adiyaman has extremely dark, purple-brown flowers. The guinea hen fritillary, or checkered lily, grows 12 to 15 inches tall and has a single purple or magenta flower decorated with a pattern of brown spots. Alba is a pure white variety that lacks the spotted pattern. 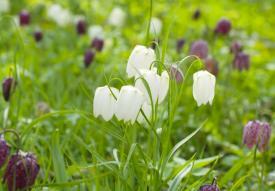 Fritillaries grow best in cool climates and are very cold hardy. They like rich, moist, well-drained soil and grow in full sun or partial shade. Though they bloom in spring, these bulbs should be planted in fall. The tallest varieties should be planted eight to 10 inches deep, while the smaller specimens are okay to plant three to four inches below the soil line. The bulbs are customarily planted on their sides because there is a cup-shaped divet at the top where the flower stalk comes out that will fill with water and cause the bulb to rot. It is also helpful to mix a bit of sand or finely ground gravel into the planting hole to help with drainage and avoid rotting the bulbs. 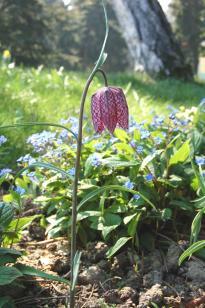 Fritillaries need regular water, especially while they are flowering. And, they will flower better if fertilized in early spring - look for a fertilizer formulated specifically for bulbs. After the flowers are spent, cut the stalks to the ground, but leave the foliage at the base to photosynthesize and store energy for next season's growth. Established patches of fritillary can be divided and transplanted in fall. The bulbs are very sensitive, so try to maintain as much soil around them as possible when moving. Unlike tulips and many other bulbs, it is not recommended to store fritillary bulbs indoors for the winter, as they rarely remain viable. 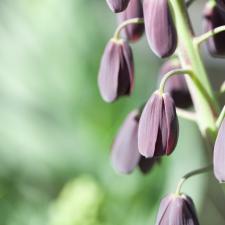 Though it is finicky about being planted in the right environment, fritillary is generally free of pests and diseases. 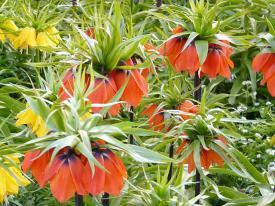 However, the crown imperial fritillary does have one major downside - its smell. Its foul odor has earned it the nickname stink lily, making it a poor choice as a cut flower, though it is still wonderful when massed with other bulbs and viewed from a distance. There are few flowers for northerly climates more stunning than the fritillary bulb. Specialty nurseries offer hundreds of unique cultivars, making it possible to grow a fritillary in almost every color of the rainbow.